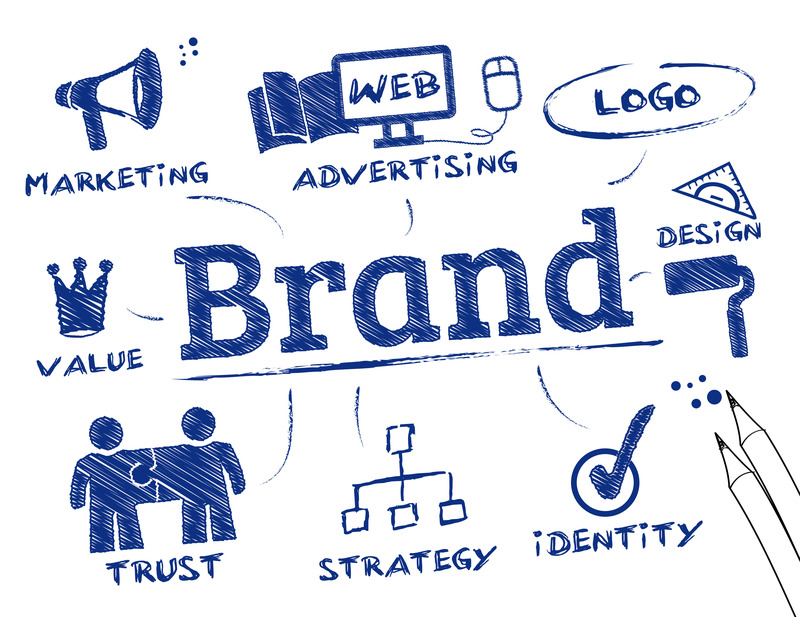 LSP Maturity: Brand Themes | Language Solutions Inc. In our LSP Maturity series, we turn the focus on ourselves and this time we would like to talk about our brand themes. McKinsey&Co. wrote about a study that compares how businesses and their customers view the same themes around the brand of an organization. We picked the top 5 brand themes that are most important to customers and how they correlate to our brand principles. Cares about honest, open dialogue with its customers and society. We explain how our industry works and are honest about customer expectations. We are not afraid to push back and explain our expectations. Having a greater understanding of our customer’s business model, their goals, objectives and metrics are the important keys to their success. We also foster dialogue about the end user and take their perspective in the discussions around a project. We advocate for the second language speaker and help organizations reach their audience in a meaningful way. Acts responsibly across its Supply Chain. We support a high ethical behavior towards translators and other vendors. We pay our vendors on time as well as with their rates (no rate bullying) and only employ vendors who are experts in their field. We help vendors grow in their profession by helping them with training on software or including them in the quality process. We support high ethical behavior towards customers by helping people to grow in their profession with global competency and to help identify and recommend cost efficient processes throughout the organization and the entire supply chain. Has a high level of Specialist Expertise. Our main verticals are Healthcare Communications, HR and Employee (Benefit) Communications and Marketing/Branding Communications. We’ve extended our Healthcare expertise to Health Literacy writing and practices about 8 years ago and have proven results and Health Literacy Awards. We differentiate ourselves by the people that we work with to perform our translations. We standardize our approach to vendor selection in our ISO 9001:2008 standards and process management and with our work and commitment to Baldrige Performance Excellence. Fits well with my values and beliefs. We understand that exposure to language and translation differs per person and that buying behavior is emotionally attached to this experience. For years, we advocated not only for our clients, but also for the people that we work with by helping them grow their global competence. In fact, our blog on advocacy is mostly focused on empowering professionals in the Healthcare, HR or Marketing field with strategies and insight to be confident global communication professionals. Healthcare Expertise trusted by Major Clients. Recently published our own study on healthcare terminology and created standards for healthcare terminology. How does this stack up against our Moments of Truth? Make me look good – This speaks to the first and second theme. We care about the result, not only the translation result but also looking at how the overall project has an impact on the organization. Make me feel important – This speaks to the second and fourth theme. We help everyone to grow as a professional by explaining and supporting project requestors as they work with us on translation jobs. 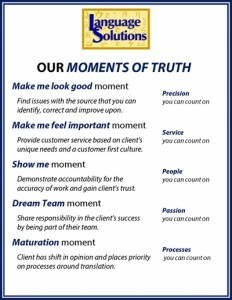 Show me moment – We are responsible for our results. This could relate to the second, third and also the fifth theme. Having an ISO 9001:2008 certified documented process helps us to be accountable and offer continuous improvement. We certainly feel that customer service and meticulous and documented organization is one of our leading capabilities. Dream Team Moment – We think this fits in well with the first, second and fourth theme. Acting as a team helps to facilitate an open and honest discussion, increase our reach across the supply chain and it builds relationships that can grow on the values and beliefs that we share. Maturation Moment – This is a true leadership item (fifth theme). While many LSPs still are defining their process of localization maturity, we have already developed and documented clear processes, goals and metrics for organizations that going through the maturation process as their global communication needs grow. It should be noted that the theme of low pricing was ranked lowest by customers. Also, compare these themes against our Ideal Customer Profile.